3) Whilst in mid jump you will be presented with arrow keys to press (left and right) press them in the correct order before the guy lands otherwise he will fall! Created for Ludum dare 30 #48 Compo. Theme: Connected Worlds - The connected worlds link between a person and the world inside them. 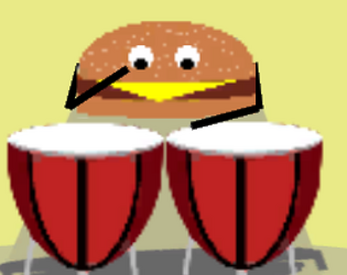 In this game the chap eats some food and this is what is powering him a long. The burger is beating the drums to keep the chap moving a long. First attempt at a Ludum - has been an awesome experience and I will take a lot away from it. Certainly will plan it better next time!